In the late 20th century, Earth was invaded by a technically superior race of brutal alien warriors. Five billion humans were exterminated in a matter of days. Humankind was all but obliterated. Those unlucky enough to survive were enslaved by the "Masters." Only the strongest, fastest and smartest of these slaves learned to endure. For entertainment, the Masters forced chosen slave fighters, satirically called "Hunters" to kill or be killed in dark, lethal arenas deep in the bowels of the decimated cities. Earth was not the only civilization overrun by the Masters. The planet Kullrathe, home to a savage species of beasts, also fell under their dominion. Beast soldiers were captured and held in concentration camps where they too were forced to play the Masters' "Hunter Hunted" game. The date is now 2015. The Masters have selected champion Hunters from each planet to fight to the death. Whether you choose to be Beast or Human, your only hope is to escape. Scattered within the Hunt Arenas are remnants of the civilizations the Masters destroyed. If you can survive long enough to collect the necessary pieces of technology, you may be able to build a vehicle and escape. 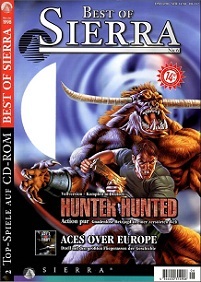 Hunter Hunted, developed by Dynamix, is one of the two action games of Sierra's k.a.a. series, alongside its cousin, CyberGladiators. Many also consider it as a part of the Earthsiege Universe as one opponent, named Bruiser, is a Cybrid. 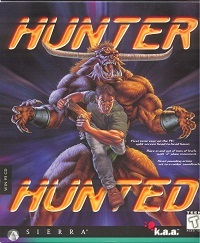 In Hunter Hunted you play as the human, Jake, or the beast, Garathe Den, in 65 single-player missions or 35 split-screen multiplayer missions. Both characters each have their own physical abilities and weapons. While the beast is stronger and faster, Jake has more powerful weapons in his arsenal. While Jake and the beast sometimes have to fight each other, each level is also filled with countless other creatures, such as hovering mines, chaos creepers, chameleons and even Death himself. To make things even harder, each level is filled with traps, such as poison steam, electrocution traps and moving walls. Combined with a heart-pounding music score of electronic music and rock, this game will boost your adrenaline flow as you pass each level, searching for components for an escape vehicle in the midst of hell.